Dynamic Currency Conversion, DCC - biggest enemy of any Monzonaut! Confusing screens , double negative questions , sometimes even three screen prompts to select DCC can really make it difficult for good Monzonaut to steer clear from DCC. I haven’t seen an example where ATM or POS with DCC offered better rate than Monzo (fees included). Even with planned ATM withdrawal fees, rule of thumb - Monzo is better and will be better because Monzo doesn’t charge any mark up on exchange rates. However, if you had seen an example where DCC would be cheaper than Monzo or did the math - comment here! Dynamic Currency Conversion is nothing more than the merchant or ATM provider and their card processors like Elavon trying to generate extra profits by providing “service” that MasterCard&Monzo would do for free. In some rare scenarios, ATM might only offer their own exchange rate. If you don’t like it, you’ll need to find another ATM or accept your fate (and bad exchange rate). Holidaymakers face unnecessary charges when they use their credit and debit cards overseas. How to check if your purchase went through with DCC? If transaction appears in local currency, you’ve got Monzo rate! If you don’t have internet connection, you can find it on receipt from ATM or POS. Below examples of ATM and POS screens from google images. This one says 0%, but commission is hidden in ‘monex wholesale rate’. Merchant can ask what currency you’d like to pay in - always ask to be billed in local currency. If you are given a terminal and you’re not sure what button to press to skip DCC, ask merchant. And beware, all receipts are printed with remarks that you accepted DCC, so if you didn’t accept it - contest it immediately. That being said, getting into arguments with local merchants might be unpleasant experience, so if you lost a little bit of money because of DCC, it might not be worth the hassle and lost nerves/time to get it sorted, when you could stay in the holiday spirit instead. Using abroad - credit or debit? Best way to use Monzo? Thanks for this. I think it will help a lot of people. I am very aware of this and make sure I go for without conversion. I was in Greece in July & with a different card the retailer forced DCC. Complaining led to nothing than being fobbed off. So we hit them were it hurts - didn’t go as often. We would normally go to this restaurant for lunch 7 times - we went just twice so we lost £2 through DCC - they lost €250 worth of sales. Other restaurants didn’t do it and thus benefited from our custom. thanks for this! im going on holiday soon so its great to see some examples of ATMs and POS machines. I saw somewhere that you’re asked a series of questions when withdrawing from the ATM. The answers you give prevent you from paying extra fees or something like that. I looked in the FAQ but couldn’t find it. Does anyone have a link to that bit of info or maybe you know what the questions the ATM asks you and what answers I need to give? Would these questions at the ATM be similar to ones on other cards such as Revolut? I’m guessing that you’re asking about the types of questions that’re shown in the screenshots at the top of this topic so I’ve moved your post here. Just let me know if that’s not what you were looking for. These questions will be asked if the machine offers DCC, regardless of which card is being used, as long as the card’s from a foreign country. Thank you. Though I’m sure Monzo did some sort of guide like this. Maybe it was Revolut. I’m going to Georgia so it will be interesting to see what happens with closed currencies and what their atms are like. Will report back on my experience overall anyway as I see there aren’t many Monzonauts who have been there. Very useful, be nice to have this in the FAQ as a feature. Why does the EU commission stop all this mark up and extra charges? Recently I paid for a three night stay in a hotel I think it was around ¢900 lloyds charged a transaction fee of £1.50 and then a commission charge of £23 disgraceful. That was the charge when paying in Euro’s cant wait to use my Monzo card next time. Even when in a hotel or shop. you have to make sure they are charging in Euro’s sometime they don’t listen. You say ‘stay in the holiday spirit’ but that’s what allows these crooks to continue. Technically, MasterCard considers forced DCC a valid reason for a dispute (chargeback reason code 4846) but good luck getting your bank to actually side with you on this one (Monzo - what’s your take on this, are you willing to fight for your cardholders and dispute forced DCC with a merchant?). I just want to say thank you for this post! I remembered reading it last year and because of this it saved me around £15 when getting currency out from an ATM. I would love to know why they are allowed to charge so much for the currency conversion option? Basically, I got to Gatwick and realised it would be good to get Euros for my trip (taxis etc) and rather than using the currency desks I decided to get Euros from the ATM (had this post in mind), I opted for €100 and the conversion was telling me it will cost me £104 (crazy!) so I declined although it really wasn’t clear that was an option and continued with the transaction. the cash came out and a notification from Monzo told me I had spent £88 for €100. I just wanted to add a quick reply on this to get it bumped up for the community to see it again, holiday season is upon us so don’t get caught out by unnecessary charges. I believe it was the ATMs attached to the MoneyCorp stand but as I mentioned it really was not clear I had the option to not accept their offer, I think it was just asking if I wished to proceed Yes or No and I hit No because what I was being offered was ridiculous, it then went on to the next screen saying it will use my banks currency option. Hi @Wheatley and thanks a lot! I can confirm, I also managed to get Euros in a non-DCC way out of some ATM in Gatwick airport, I just don’t remember the name. I would love to know why they are allowed to charge so much for the currency conversion option? It doesn’t seem to be very regulated (to the best of my knowledge). ATM withdrawals are a service and they can charge for it. Majority of old-school banks also add a fee to any currency conversion, and it’s one of the revenue streams. Only brave few banks, Monzo being one of them, pass clean exchange rate without any markup. It kinda means that most travelers without Monzo (or other brave bank) will lose either way. They are going to be hit by their bank’s fee on currency exchange (and stupid rate) or they get hit by DCC. It’s worth reminding that ATM withdrawals via Monzo have a fee after withdrawing £200 in a rolling month, but card purchases in shops/restaurants/online are not a subject to this £200 limit. 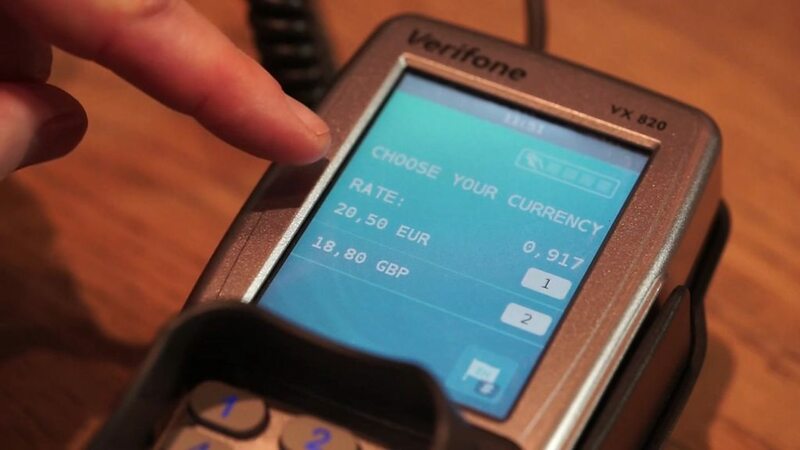 Old school banks apply fees to all card transactions in foreign currencies.